This is a deceptively simple video! 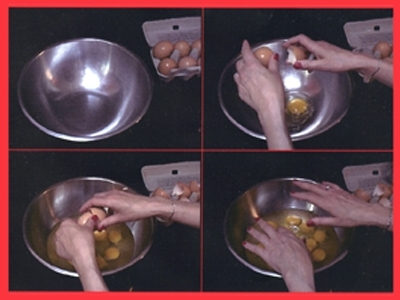 Structurally, the video includes the visual representation of an action that is repetitive but varied (each egg cracks differently!) in combination with an audio tract that is repetitive with no variation. The monotony of the repeated action and voice-over narration are symbolic of the monotony of domestic chores. And yet, the repeated statement is an emotionally powerful trigger, suggesting the complexity of the mother/daughter relationship.